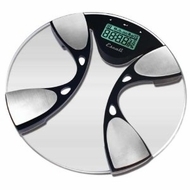 The Escali BFBW200 bathroom scale features advanced digital weighing technology that provides a high tech analysis of the fitness level of the user. This scale measures percentage of body fat, body water and weight for up to ten individual users. The scale has a large capacity of 440 lb / 200 kg.